Adult Tissue Morphogenesis Research Group. Our group investigates the biological processes responsible for the development of organ shape and form (morphogenesis). Although morphogenesis is often studied in a developmental context, our interest is in the acquisition of shape and form in adult tissues. Morphogenesis is a process generally linked to tissue repair and regeneration, but clinically relevant to the understanding of a variety of diseases. In addition, morphogenesis is a fundamental issue in many contemporary approaches to tissue engineering. The process of adult tissue morphogenesis is intriguing because it is self-organized and involves complex structural, cellular and molecular interactions. A primary focus of our research group is the growth and patterning of new blood vessels (angiogenesis). Blood vessel networks are generated and modified during development, physiologic stresses (exercise) and tissue repair. The mechanisms responsible for vascular patterning include sprouting and intussusceptive angiogenesis. Intussusceptive angiogenesis is a particularly intriguing mechanism of network expansion because it involves the splitting of a single vessel into two lumens. This morphogenetic process allows for the rapid expansion of existing microcirculatory networks without compromising tissue blood flow. Intussusceptive angiogenesis appears to be a primary mechanism for vascular expansion in the lung; it also appears to be a prominent mechanism of tumor-induced angiogenesis. An understanding of the mechanisms of vascular patterning offers the potential for therapies in ischemic diseases (brain, heart and peripheral vascular disease), cancer, wound healing and tissue engineering. Lung Regeneration Working Group. An interesting observation in most mammalian species is that removal of one lung (pneumonectomy) leads to the compensatory growth of the remaining lung. The majority of the compensatory growth occurs within a week or two of pneumonectomy and involves a dramatic increase in both lung volumes and the number of airsacs (alveoli). In fact, the lung is nearly back to baseline volume and function by 3 weeks after pneumonectomy. Equally dramatic, the lung undergoes significant angiogenesis; estimates of capillary growth vary, but post-pneumonectomy angiogenesis may involve more than 1km of new vessels within 2 weeks of lung removal. Although not yet demonstrated in humans, the observations in experimental models suggests that “reverse engineering” lung regeneration will provide important clues for understanding human lung repair and regeneration. 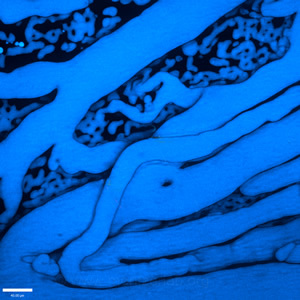 Grid confocal fluorescence micrograph of the chick chorioallantoic membrane microcirculation after casting with blue fluorescent dye-containing polymer resin (intussusceptive pillar is visible at the bifurcation). Copyright © 2012 The Mentzer Lab. All Rights Reserved. Site designed by Academic Web Pages.